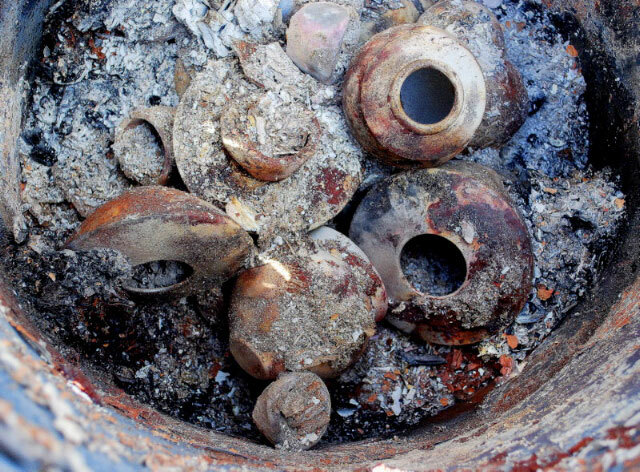 Each piece is thrown on the potter’s wheel from white earthenware clay that matures at (cone 04) 2,008 degrees Fahrenheit. Once the piece is leather hard, a polished agate to “rough burnish” the surface of the piece. This mashes down the larger particles of clay, smoothes the surface and brings up the finer particles of clay. The piece is dried for a few hours and the final burnishing is started. This final burnishing makes the surface extremely smooth and shiny. There is no glaze applied to these pots. When the piece is bone dry, three to five coats of terra-sigillata (very fine particles of clay) are sprayed on, and polished with the palm of the hand and a chamois (soft leather). 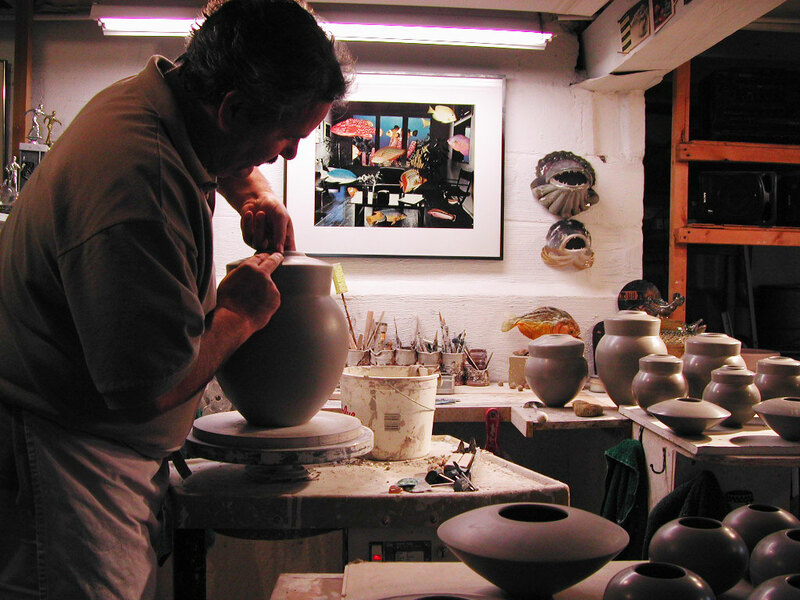 The work is then bisque fired at a relatively low temperature (cone 016) 1,517 degrees Fahrenheit. Bisquing to this temperature gives the work a fair amount of durability. At this point, the pieces are bright white. 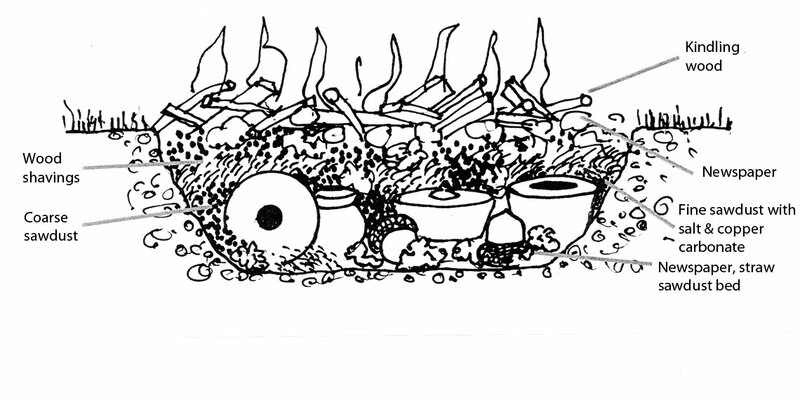 The final step is a firing technique used by many ancient cultures. As they did, the work is loaded into a pit (a 3' x 4' hole in the ground), and fired in combustible materials (fuel). These materials may include burled wood shavings, a variety of sawdust, newspaper, straw, metal shavings, ceramic frits, used steel wool and sandpaper, and manure. The fuel is essentially someone else’s garbage. 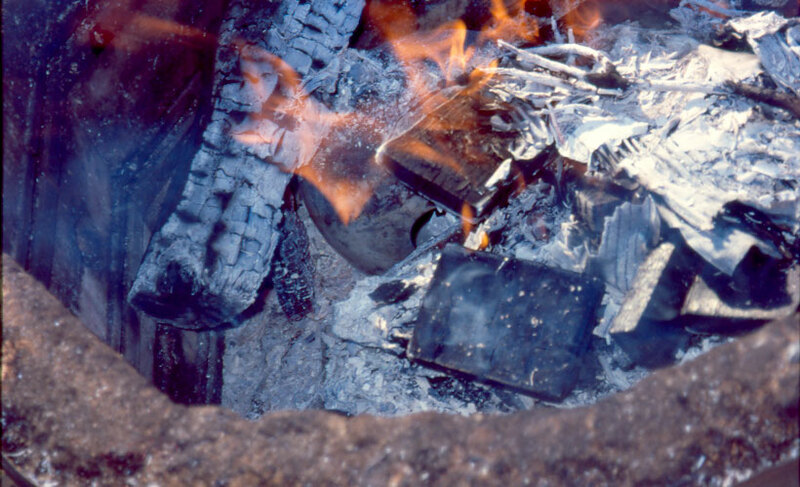 The burning of these materials traps carbon on the surface of the burnished forms. 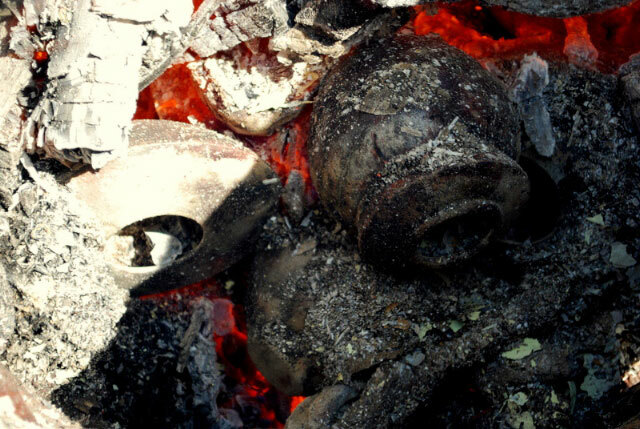 Where the fire burns hot, the surface of the form will be gray to white. Where the fire burns slowly, it will be black. 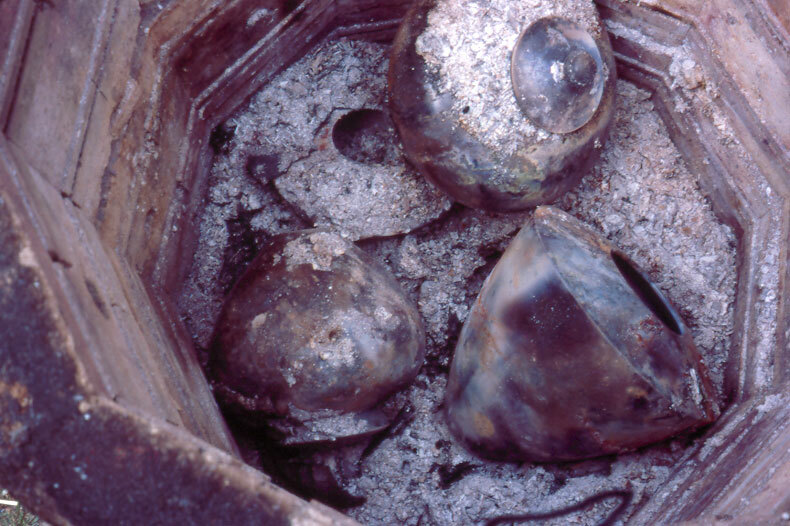 The firing time is between 18 to 24 hours. 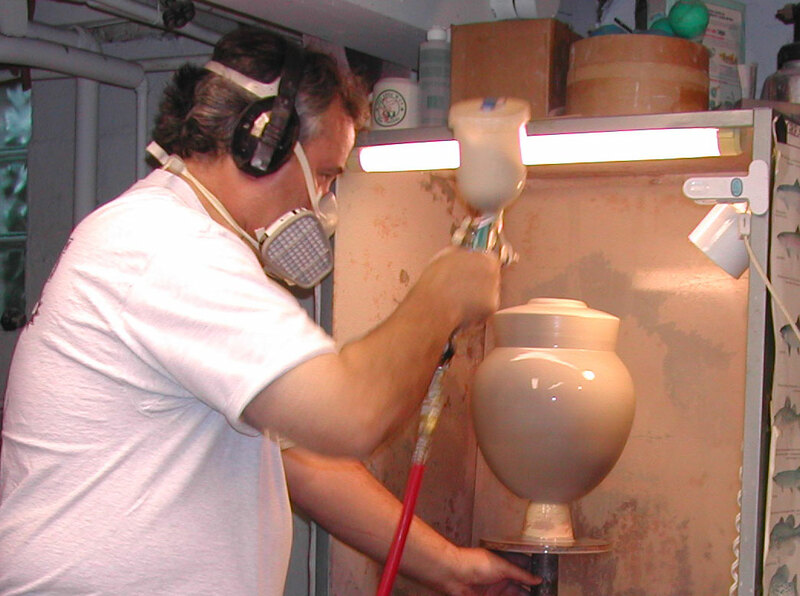 Once cooled, the finished pieces are cleaned and polished three more times. In spring 2005, Alex led a pit fire demonstration and workshop at Southern Illinois University Edwardsville (Read more and view photos…). © by Alex Mandli. All rights reserved.